This is a brief pro-forma letter to be signed by employees working within the UK who wish to work longer than an average of 48 hours per week as provided for by the Working Time Regulations 1998 (as amended). 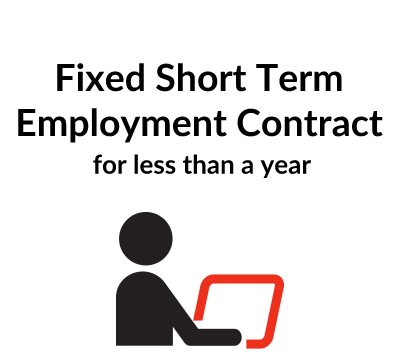 You need this document if you are an employer whose staff wish to work longer than an average of 48 hours per week. 1. 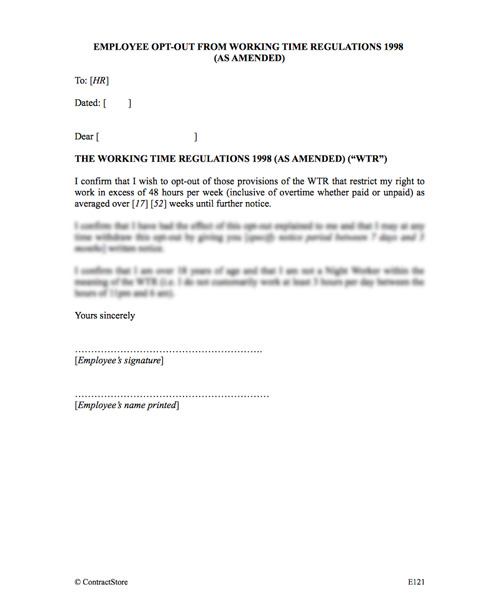 This letter must not be used in respect of employees below the age of 18 who are unable to opt-out of the WTR restrictions (essentially they are limited to a maximum of 8 hours per day, 40 hours per week and in most cases are not permitted to work between the hours of 10 pm and 6 am, or, exceptionally, 11 pm and 7 am). 2. Night Workers, defined as those who customarily work at least 3 hours per day between 11pm and 6 am, are also unable to opt-out on an individual basis (but may do so if there is a collective or workforce agreement). Note that Night Workers are subject to particular provisions including the right to regular health checks at the employer’s expense. Further guidance may be obtained from either ACAS or the Department for Business, Innovation and Skills. 3. Employees in the road haulage industry are covered by provisions peculiar to them and therefore this letter is unsuitable for such employees. 4. 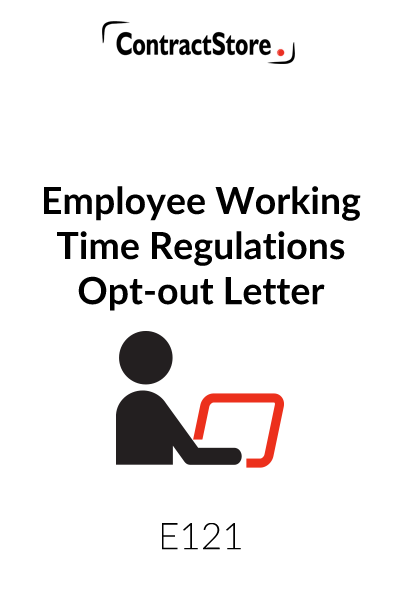 The period of time used to calculate an employee’s average hours is 17 weeks and the length of notice that an employee must give to withdraw an opt-out agreement is a minimum of 7 days. 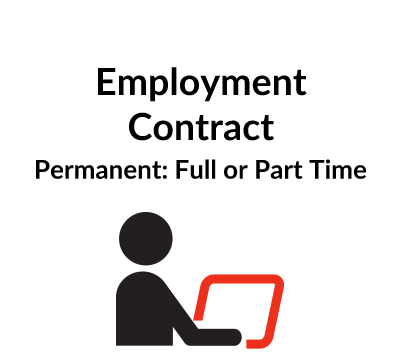 Where an employer enters into a legally binding “Workplace Agreement” with either a recognised Trades Union or employee representatives such as a Staff Association it is possible to agree more flexible provisions relating to both the period used to calculate an employee’s average hours (up to 52 weeks) and the length of notice that an employee must give to withdraw an opt-out (up to 3 months). For those workers whose work requires them to stay away from home for long periods, the averaging period may be increased to 26 weeks. 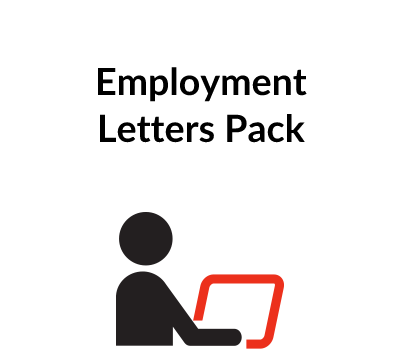 It is also open to employees to agree with their employers to give between a minimum of 7 days’ and a maximum of 3 months notice to terminate the opt-out agreement. 5. It is important that an employee both understands the effect of signing the opt-out and is not placed under pressure to do so. For this reason it is inadvisable to incorporate an opt-out within a new employee’s Contract of Employment: the two documents should be quite separate. 6. Although the WTR exempt managing directors (i.e. those who have control over the hours they work and whose time is not monitored or determined by their employer), it is prudent to ask all employees including directors to sign the opt-out to avoid subsequent dispute. those who have not or cannot opt-out (i.e. minors and night workers) must have their hours recorded whether by way of existing payroll data or otherwise. 8. Note that opt-outs cannot alter employees’ rights to annual leave, adequate rest breaks each day and the right to one day off per week or two days per fortnight. 9. This letter is in accordance with the law as at 5th April 2010.